Have you missed me? I will bet not, but I have missed having finished projects to write about. We finally have a minute to breathe and start dressing the house. It is nice to not be opening boxes. Most of my house is almost put together, but none of it is done. F.r.u.s.t.r.a.t.i.o.n. 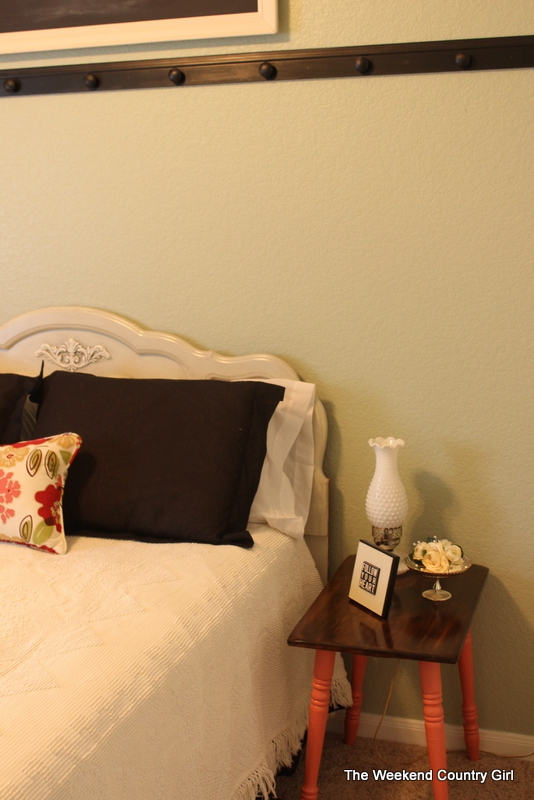 The first room that I feel like is almost there is our green and coral guest room. It didn’t hurt that the walls were already painted a pleasant color I could work with. After one week of hard work we have it almost finished…I think…for now anyway. The smallest guest room is finished except for some way to display my milk glass and something interesting to go over the bed. I am still thinking about those projects, but something will come to me. Any ideas? I also have a coral accent piece in mind, eventually. The links below will take you to the projects that were added to this bedroom. The French Provincial dresser is in place. 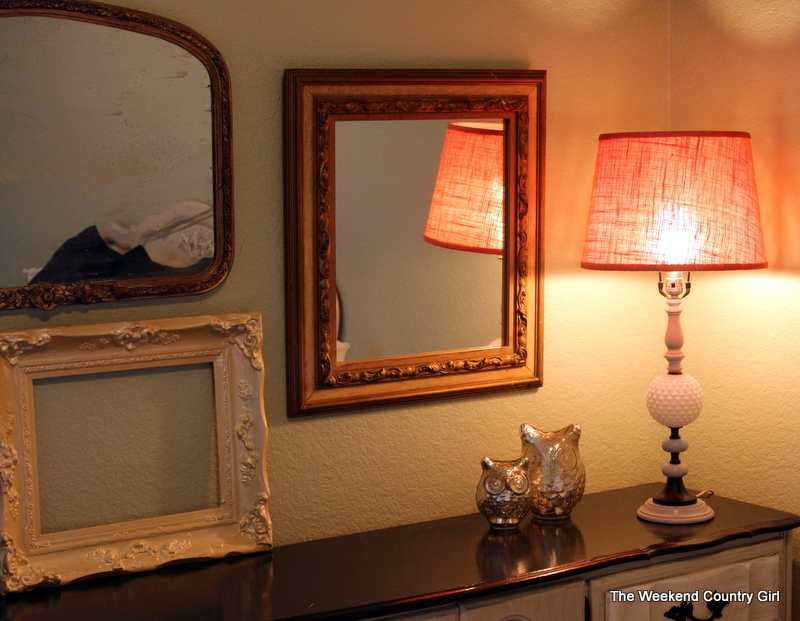 I did not love the mirror that came with the set with the dresser in this room, so I used a few of my vintage mirrors over the dresser along with a frame from my gray bedroom there. I like the look! 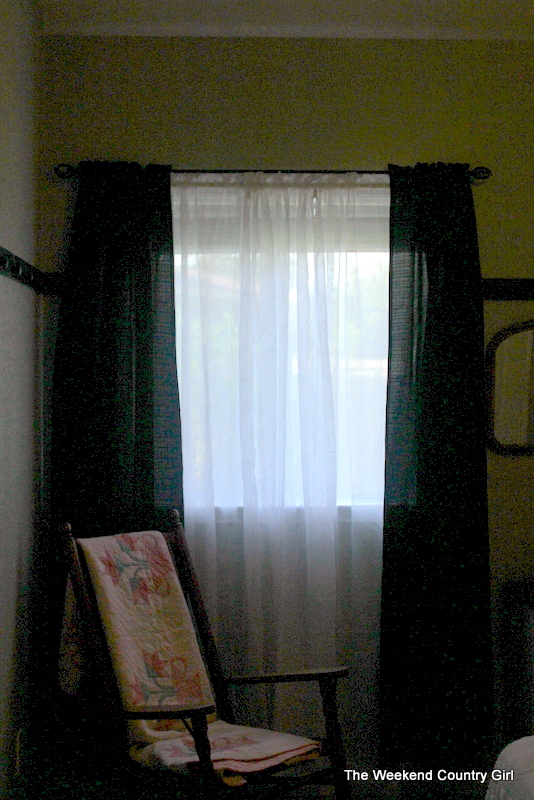 The bedding was my grandmother’s and so were the milk glass lamps on the night stands. I love that they have found a home in this peaceful room. The rocker was my dad’s great grandmother’s. It needs to be re-caned, but I love that she sat in this chair so many years that she wore the cane out on one side, We bought the quilt years ago and I am always happy to find a place for the flower basket pattern. The coral accents on the milk glass lamp, pillow and table legs add to the green, black and white theme. 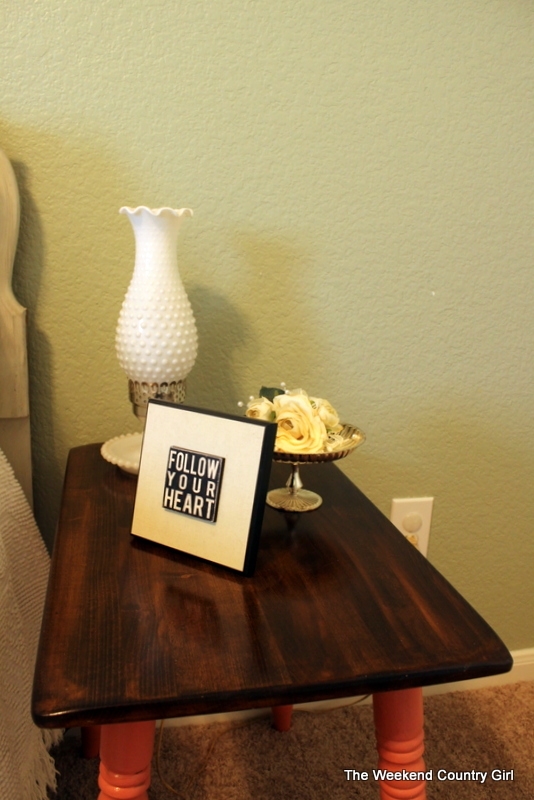 The flowers were from Baby Boy’s wedding to Sweet Amanda and the Follow Your Heart sign was a Goodwill find for .99. 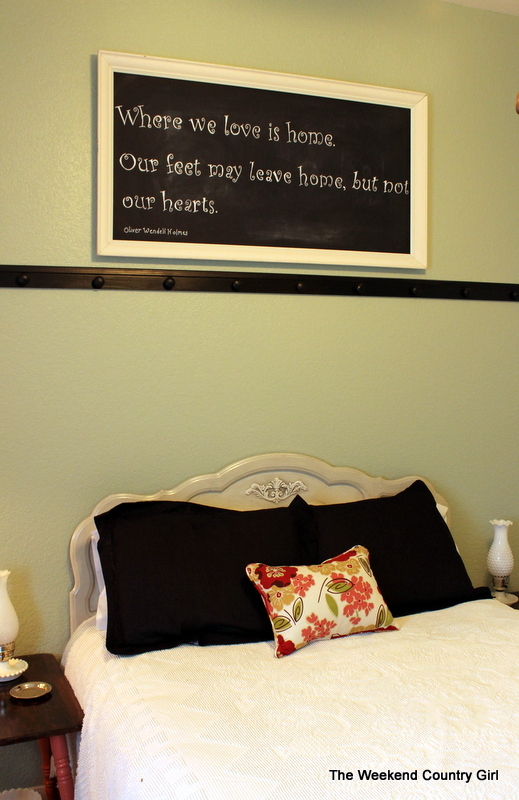 I love the chalkboard above the black rail. It is fun to be able to change the quote when the mood strikes. 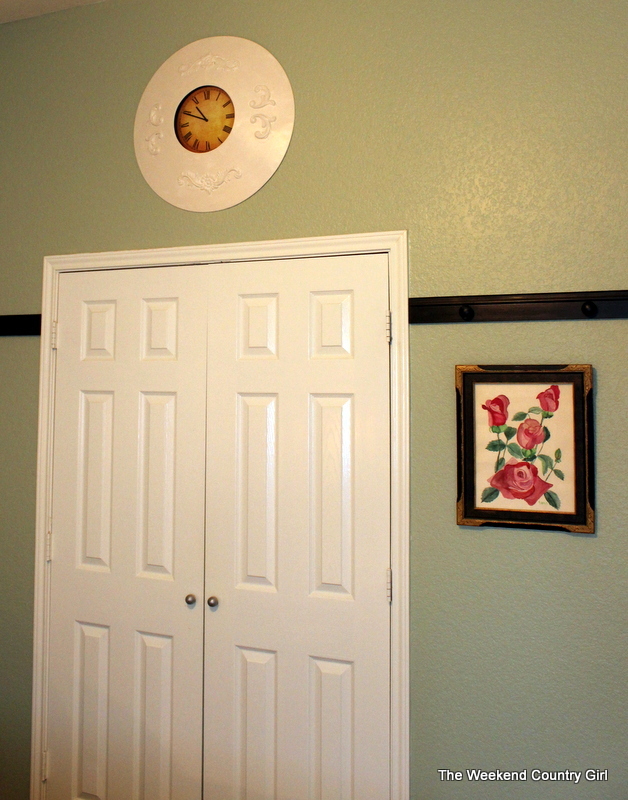 The clock has bounced around my offices, our house and the garage but I thought it looked good painted in the room. The watercolor in the vintage frame I painted circa 1988. My parents had it in their room for a while. All in all the room was put together for under $200. Not too shabby for a totally new color scheme and furniture. 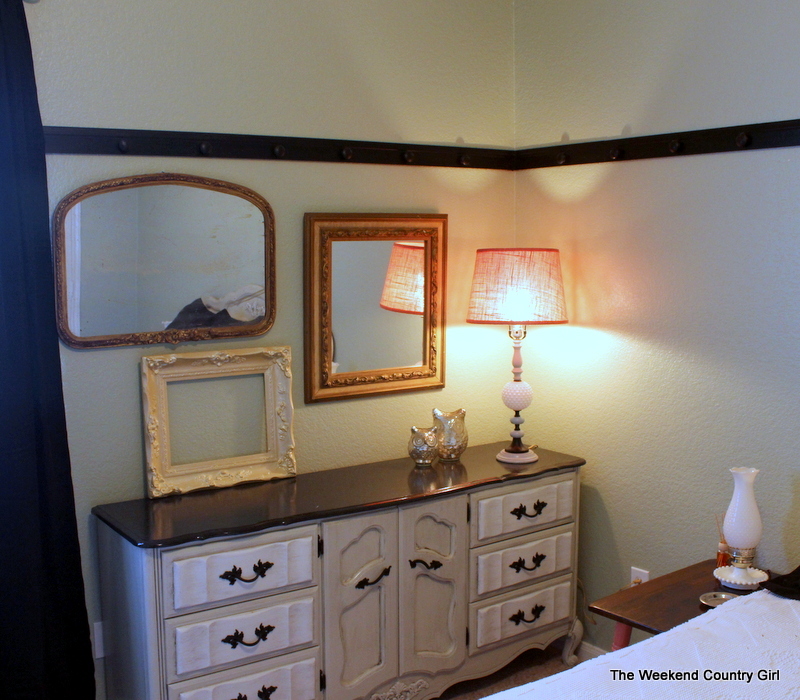 The dresser and headboard were purchased for $80.00 and painted for $15.00. The mirror went home with my friend Shahana. She has the perfect spot for it. The curtains were inexpensive black panels from Walmart and the white shears were on clearance at Anna’s. They have a nice little embroidered swirl on the fabric. The whole window was dressed for $30.00. There was no cost for the end tables. Roadside finds and left over paint. The silver owls and other accents were picked up for the yellow and gray bedroom side tables. Add in a $20,00 World Market shade and a 12.00 accent pillow and I am done for today.